7 At the end of ten days the word of the LORD came to Jeremiah. 8 Then he summoned Johanan son of Kareah and all the commanders of the forces who were with him, and all the people from the least to the greatest, 9 and said to them, “Thus says the LORD, the God of Israel, to whom you sent me to present your plea before him: 10 If you will only remain in this land, then I will build you up and not pull you down; I will plant you, and not pluck you up; for I am sorry for the disaster that I have brought upon you. 11 Do not be afraid of the king of Babylon, as you have been; do not be afraid of him, says the LORD, for I am with you, to save you and to rescue you from his hand. 12 I will grant you mercy, and he will have mercy on you and restore you to your native soil. 13 But if you continue to say, ‘We will not stay in this land,’ thus disobeying the voice of the LORD your God 14 and saying, ‘No, we will go to the land of Egypt, where we shall not see war, or hear the sound of the trumpet, or be hungry for bread, and there we will stay,’ 15 then hear the word of the LORD, O remnant of Judah. Thus says the LORD of hosts, the God of Israel: If you are determined to enter Egypt and go to settle there, 16 then the sword that you fear shall overtake you there, in the land of Egypt; and the famine that you dread shall follow close after you into Egypt; and there you shall die. 17 All the people who have determined to go to Egypt to settle there shall die by the sword, by famine, and by pestilence; they shall have no remnant or survivor from the disaster that I am bringing upon them. Into the space and confusion following the assassination of Gedaliah, the governor appointed by Babylon to rule in Judea over the remnant, the interim leaders, Johanan and Azariah come with the people to Jeremiah asking for a word from the LORD. Based on previous times when kings and leaders have asked for a word from the LORD there is little expectation for the reader that it will be heard and obeyed, yet here in desperation the people come and finally they come to Jeremiah who they have ignored so many times before asking his prayer to God. It is very possible that Jeremiah is tired at this point and yet he consents and goes once again in prayer to the LORD. In contrast to Jeremiah’s reluctance (Very well: I am going to pray to the LORD your God as you request, and whatever the LORD answers you I will tell you, I will keep nothing back from you) and the peoples’ insistence (Whether it is good or bad, we will obey the voice of the LORD our God.) Yet, in the space and time of waiting the people probably don’t sit idle. Why does it take ten days to answer? We will never know the answer, but ultimately God doesn’t work on our time tables, but in that time when Jeremiah returns to give the answer it is clear he knows which way the peoples’ hearts are leaning. The LORD’s answer presents two choices, one in obedience with an accompanied blessing and on in disobedience with an accompanying curse. Much as the end of Deuteronomy ends with blessings if the people keeps the commandments of the LORD and curses if they do not. If the people listens and stays within the land the LORD promises an end to their disaster. The LORD will build and not tear down, plant and not pluck up, that in the midst of the present threat of Babylon’s retaliation the LORD promises to protect them and to give them mercy. In the response we hear that the LORD is sorry for the pain that God’s people have endured and that this remnant finds themselves within and so if they will obey they will have the opportunity to begin anew. Yet, if they do not obey, if they seek security in Egypt then the very things they fear here in Judah will find them in Egypt. Sword, famine and pestilence will follow them, their name will become dishonored and an object of not only shame but horror. Jeremiah tries desperately to convince the people not to go to Egypt, and it is quite possible that he knows that is the journey the people are preparing for, and yet once again he tries to get the people to see something which seems to run counter to their own intuition. 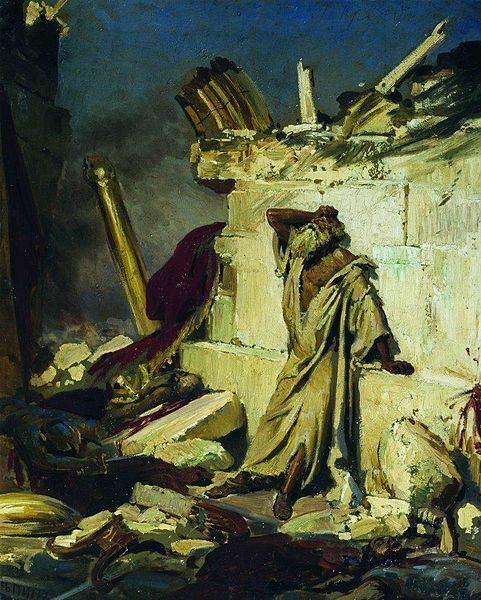 In the face of the destruction of Jerusalem, the temple, and the taking on much of the people of Judah into exile this small remnant has seen ample reason to fear Babylon. It may be very difficult for the people to trust God at this point, and at points they seem to distance themselves from the LORD (your God) and at other points want to claim God (our God). Egypt being the other major power in the region from a military/political standpoint makes sense as a place to flee to when fleeing the Babylonian empire, but here they are asked to trust the LORD, something they have failed to do to this point, and to listen to the LORD’s prophet, something else they have failed to do. This entry was posted in Jeremiah and tagged Flight to Egypt, Gedeliah. Bookmark the permalink.